I finally used our Kitchen Aid pasta attachment - and I made a mess! There are several things that I learned from this process that I will modify when I do this next time. First of all, I think the eggs would have been better incorporated had they been at room temperature (I used straight-from-the-fridge-cold eggs). The process of kneading and flattening the noodles went great, and then I put the flat noodles through the spaghetti cutter aannnnnnd MUSH came out! Secondly, I should have used "double-zero" flour like Court5203 suggested. Ultimately, I made fettuccine noodles buuuut they clumped together in the pot. Thirdly, I should have used more flour to make the noodle "nests" before I froze them. All-in-all, the dish turned out great. The dessert turned out even better though...*drum roll* Cappuccino Fudge Cheesecake! No - pictures will not do this cake justice. Best-cheesecake-ever. I have witnesses to back me up. Recent Wooster certified top-rated recipe Ginger Glazed Mahi Mahi - yum & easy! My close college friends Rob & Lisa who recently moved to Austin invited us over for a fall dinner party last weekend. I contributed a Pear+Craisin+Candied-Walnut Spinach Salad and Bloomin' Onion Bread (OMG this is so good I literally could eat the whole loaf). I also chefed-up the best risotto I've yet to find, from Cooks Illustrated (March 2007) - Butternut Squash Risotto. The time that it takes to make this risotto is WELL worth it! Andrew shared his favorite fall>winter beer, Affligem Noël Christmas Ale. Rob served us a slow roasted Beer Chicken & Homemade Apple Pie. Wow, what a great night of food, friends, & delicious drinks! 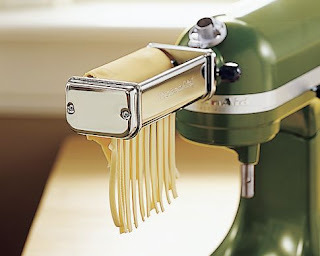 My goal for this week is to host Rob & Lisa for homemade pasta so I can finally put to use my Kitchen Aid Mixer Pasta Attachment. Otherwise, this week I'm serving up hamburgers & sweet potato fries, blue cheese stuffed chicken with Buffalo sauce (Cooking Light, March 2010), and masala salmon with basmati pea rice. We had a great+fun Halloween! First of all, I made Pumpkin Nutella Bread, which Andrew loved (my palate just doesn't know what to do with pumpkin AND chocolate). I was happy to carry on my family tradition of making AWESOME homemade Halloween costumes. We grew up wearing homemade Halloween costumes. My mom would take us to the fabric store and my brother and I would sift through the large pattern books to pick out our Halloween costumes. We were always the "talk of the neighborhood" on trick-or-treat night. This year was no exception for Andrew and me on 6th Street - Downtown Austin. Kermit & Miss Piggy were the talk of the town. It all started with a spandex body suit. I traced cardboard to fit on the bike helmet for Kermit's mouth, then wrapped an old green t-shirt around the bike helmet. I glued the t-shirt to the cardboard, and then tied the leftover t-shirt in the back with a rubber band. Next, I glued felt around the cardboard for Kermit's mouth. From this point on, there was a lot of trying on, marking with Sharpe, cutting while trying on to get the mouth just-right. Then, we glued on a pink felt tongue and cut out eye holes. The eye holes ended up being right where the fold of the felt was in Kermit's mouth! To finish it off, I just hand cinched and stitched around the gathered leftover t-shirt in the back and folded it under for a clean look. Kermit wouldn't be Kermit without his classic collar (collar from the green t-shirt used earlier & felt) and buggy eyes (stryofoam balls cut in half) - the finishing touches! As for Miss Piggy - well, she was not homemade. We ordered the wig, nose, & white gloves online. I found the dress at Goodwill for $8 and wore my classy pearls. I never pass up a reason to wear false eye lashes, also! Our first time dressing as a couple, popularizing the much anticipated release of The Muppets, and reliving my favorite childhood characters made for the best Halloween yet!!! Remember that time that the 1/2 marathon that I had been training for since June got cancelled without a refund or make-up date? I DO! So did my sweet hubby. Get this: Andrew was so thoughtful that he planned out a "replacement race" for my running-group of girls and I so that we would get our fun & run (AND most importantly chocolate and champagne at the finish line). Since the 1/2 marathon was cancelled due to rain, he appropriately named the race "Bring Back the Drought 5K" (we did 5K so all the girls who were running 1/2 & 5K could participate). We had a blast running the trails of Wells Branch and I shaved 1:15 off of my pace. I even finished in 3rd place! (out of 3 people :P). And we proudly enjoyed our well deserved chocolate & champagne after the race. I even got a medal!